How can I enable/disable Two-Factor Authentication? Two-Factor Authentication (2FA) adds an extra layer of security to your Namecheap account in addition to your username and password by requiring access to the phone number associated with your account. When Two-Factor Authentication is enabled, your account cannot be accessed by anyone unauthorized by you, even if they have stolen your password. 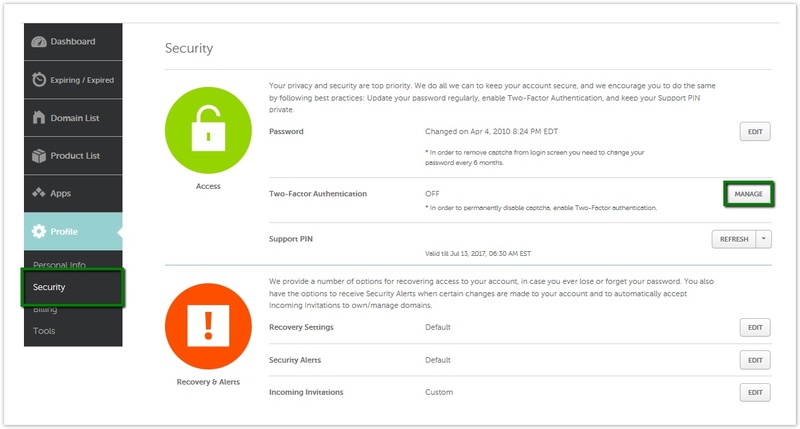 Your cPanel account can be also secured with 2FA. Two-Factor Authentication is an option we offer to our customers at no extra charge. Sign in to your Namecheap account. Select Profile from the left >> choose Security. Device Authentication (U2F). Please refer to the following article for more details. Authentication app (TOTP). 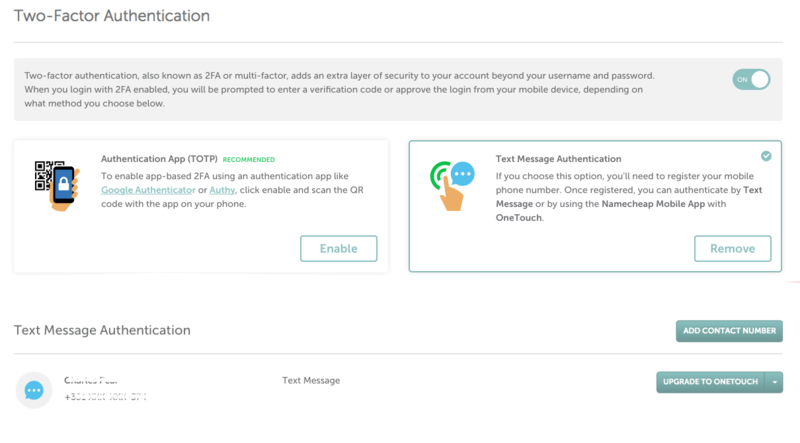 To enable TOTP 2FA method, please check out this article. Text Message Authentication which can be also upgraded to OneTouch option. - Contact Name - enter the name for this Two-Factor Authentication method. - Phone Number - enter your phone number, selecting your country code from the drop-down list. - Namecheap Password - enter your Namecheap account password for authorization. Once completed, click Next to submit the changes. If you did not get the code, click on "Didn't get the code?" 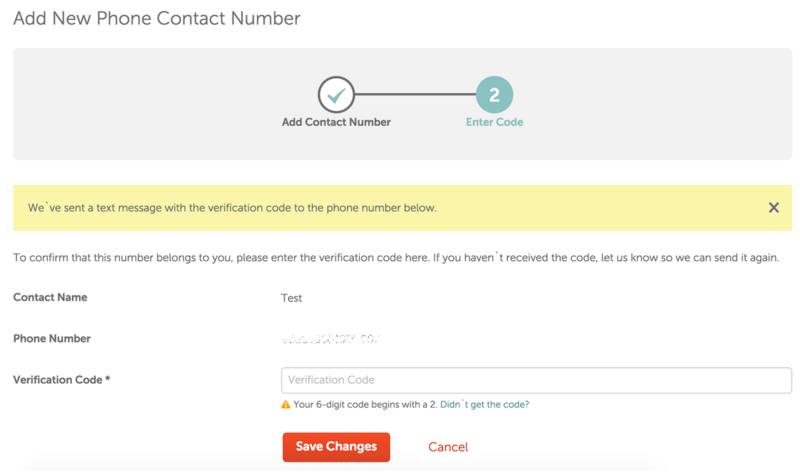 link, and you will be able to check/update the number entered and re-send the code. 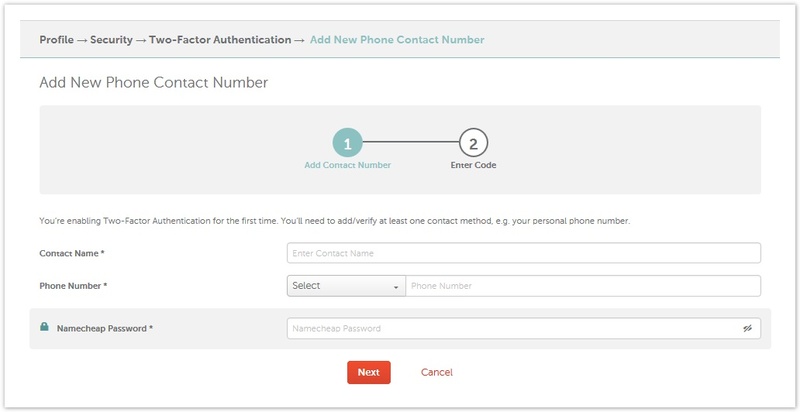 You also have an option to upgrade to OneTouch (method to approve authentication requests via the Namecheap app). 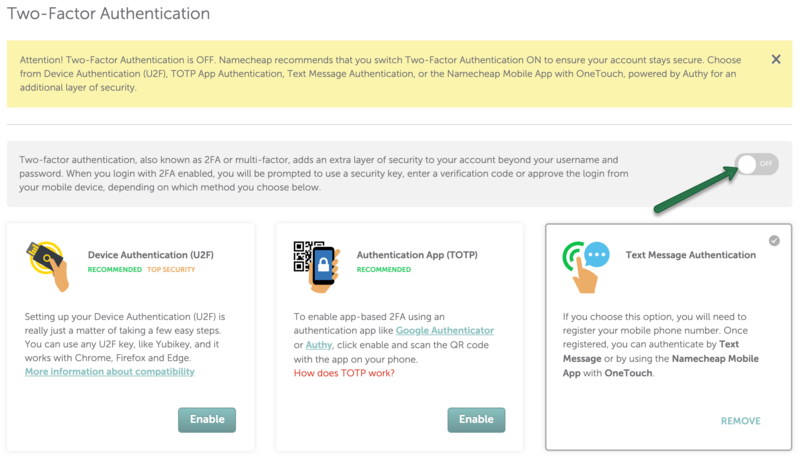 More information about this feature and how to use it can be found in the "How can I use the OneTouch method for Two-Factor Authentication?" article.